Time for some brand new music – something completely fresh and sounding fantastic. February 16th marks the release of Lizzy Small’s brand new single Always Be There. Here’s what we made of it..
Lizzy’s voice is the first thing to grab your attention, it kicks in right from the offset; the tone of it, the inflections she uses to enhance the notes – it makes the sound immediately very stylish, smooth, and easy to listen to. It’s undeniably a great voice, and on top of this; the music surrounding is of a mellow and almost trip-hop like nature. It doesn’t feel like your average pop song – it feels new; it’s personal, but entirely accessible, and clearly very meaningful, right to it’s core. The melody throughout is memorable and effective, getting caught in your mind, wrapping itself around you and becoming instantly nostalgic in a way. It very quickly feels familiar, but only in that it’s so well written and structured – everything happens just as it needs to. The clap of the drum is simple and adds to the overall captivating sound of the song. The slightly electronic touch within the music is subtle, but effective – it creates a great vibe that you can really get lost in, and yet, at the same time, it maintains it’s chilled atmosphere. The song is still as comforting as the concept of someone who will always be there for you, and so it all fuses together superbly. This kind of production is really well suited to Lizzy’s vocal style and song writing. It is indeed a heartfelt song about loyalty, love, and learning – we all go through these things, we all get our hearts broken, and we all quite often have to learn the hard way that nothing is black and white. There are some really great lyrical moments throughout this track that brilliantly highlight these kind of ideas.. The effect of these is even further enhanced by those Lizzy Small vocal inflections that make this sound her own. You know her voice when you hear it, it has as style that is unique to her – and that’s a wonderful thing to have. 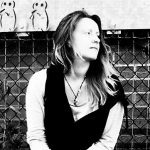 Lizzy Small has a gorgeous voice, and she uses it to it’s full advantage throughout – smart but subtle flicks, every now and then, and the bending of notes in a minimal but skillful manner. The strength of this really enhances the whole sound of the song. Melodically, the pre-chorus is as catchy as the chorus, which is rare; and really nice to hear. What’s interesting is that the power of the song comes from somewhere other than the classic addition of a key change or twice as many instruments. It stays minimal, but it builds, and in a way it’s actually louder and more striking the quieter it gets; when the music drops out, and it’s just the vocal; “Loving you is my battle..”, you really get drawn in. It’s the sign of effective song writing, and this combined with a unique and sweet but serious voice really captures your attention. Sometimes you just need to press play and see where the music takes you. So here it is, all yours as of February 16th – the brand new track from Lizzy Small – this is Always Be There..
Lizzy has recently starred alongside Jamie Lee Curtis in the Lionsgate film Spare Parts, a project well worth checking out for movie lovers and Lizzy Small fans alike. She has already amassed a considerable following of loyal supporters in her short time under the spotlight, and things look set to get even bigger as she branches out further into the multiple realms of art and entertainment. Don’t miss out – follow Lizzy on Facebook, Twitter, Instagram – stay up to date with new releases, live shows, events and news, and head over to her Website to learn a little more about her. You can also click through to Soundcloud to hear Lizzy’s addictive and equally beautiful track Gravity, released early last year. Stay involved. I heard her songs and I can say that her voice is really good! She loves music and music love her the same way! Soon she will be the next big celebrity in the music industry! Good Luck Lizzy Small!